Marine grade stainless 316 steel is recommended for use in marine and corrosive environments such as service reservoirs and other treated water storage structures. 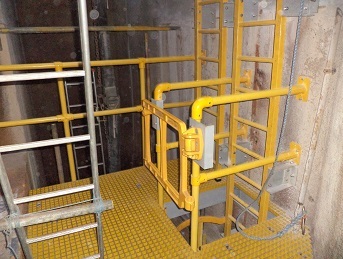 As industrial ladder and handrail installation specialists CSC Services has significant experience working in confined space installations. Galvanised ladders and hand rails are commonly used in external applications as they offer up to 50 years of maintenance free operation. Galvanised hand rails and ladders have the lowest overall cost compared to other materials which can be used. GRP and fibre glass ladders and handrails have a particular advantage over other materials in that they are considerably lighter in weight. These systems are used mainly in corrosive environments like those found in waste water treatment works, chemical and industrial plants and commercial structures which are subject to salt air and urban corrosion. CSC Services installed GRP ladders, platforms and handrails to the Drumscreen at Hartlepool Power Station for client EDF Energy following a scheme of work to install a Cathodic Protection System.